Outdoor aesthetics are just as important as indoor aesthetics. That is why outdoor fountains are extremely popular. But like other outdoor features designed to complement landscapes, they come along with challenges that have everything to do with the weather. You will have to winterize your outdoor fountain after warm seasons so as to ensure it retains its beauty. Fortunately, the winterizing process is affordable. It is also a quick and short process. Here’s how to go about it. Start by draining all the water from the fountain after unplugging it. Small fountains should not be hard to drain and clean as it is often the case with large fountains. With that in mind, have a place to pour the water you scoop from the little fountain. For large ones, create a siphon with a sturdy hose pipe. Cleaning the fountain should be easy. Be keen though if the fountain has traces of algae. In that case, use a special cleaner. Then avoid using abrasive cleaning tools and harsh cleaning chemicals. Rinse the fountain with plenty of water before draining it again. This is the most important fountain winterizing process. You can skip it if you choose to clean the fountain on a sunny day. If for one reason or another you choose to clean the fountain on a cold day, use a towel to dry the fountain. Make sure water does not leak out of your fountain’s crevice and linger on in the basin as this can easily attract algae or even mold. Do not store the pump in the fountain. Clean it too using an old toothbrush. Make sure the pump is free of slime in all the hard to reach places. The best way to store it over winter is to submerge it in a pail of clean water. That way, all seals will stay lubricated and won’t dry out. Inspect sensitive parts like the propeller and the tubing. They should be free of debris. You do not have to do this if your fountain is small and moveable. Simply move it and store it in the garage or basement. Then make sure it is covered well during winter. For large fountains in permanent locations, invest in a good cover. The cover should be weatherproof and large enough to cover the fountain without leaving some parts exposed. Remember to pull the cover tight at the bottom. Feel free to use burlap in bags in the basin just before you cover the fountain. It will come in handy in case moisture finds a way into the basin as it will quickly absorb it. Most water fountains are designed to last for decades. Unfortunately, some do not. This mostly has everything to do with maintenance. 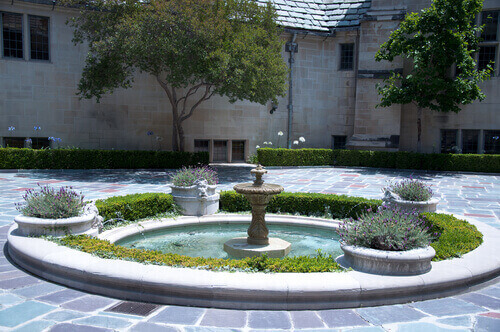 With that in mind, avoid exposing your outdoor fountain to inclement weather conditions like harsh winter. Clean it too often to remove algae or mold. Then be keen on other parts of the fountain such as the pump and other features that keep it running.